This is my forth posts in today, three of them are about #mosc2010 LMAO! I think i break my own record of most blog post in a day. By the way i also break my own record of most tweets in a day. And i also break my own record of tweeting the most meaningful spams in a day, all about #mosc2010! LMAO! 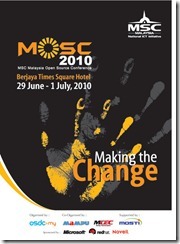 First day of #MOSC2010 ended. Lets roundup. This is my 1st time of MOSC, it was good! All the MOSC topic related posts goes here and here. But the community track and dev track could have a larger room. too crowded all the time. The food was AWESOME! I was so full all the time, ALL THE TIME! Free flow of coffee, tea, and even soft drinks summo!!! WAHAHAHAHAHAHA………………………. I can live here forever…. Speaker was OKOK, there are some really good one, and there are some i feel like …. erm…. one. most probably i dont fully understand those topics. Twitter was fun, and hopefully i will be able to win myself a PS3…. TWITTERFALL! Love it very much! Air cond was not too cold and not too warm! The TSHIRT!!! RM30 IS TOO EXPENSIVE! Everyone should get one for free! Registration too early and not start in time. The BIG BIG BIG THING! WORDPRESS MINI MEETUP!!! (and right after that will be webcamp!) Hohoho! Another Hard Drive for lucky draw?! Hahaha I WANT THAT! and more knowledges to be gain. Thats all for the 1st day of MOSC. Will continue the awesomeness tomorrow as a blogger, and the future developer!